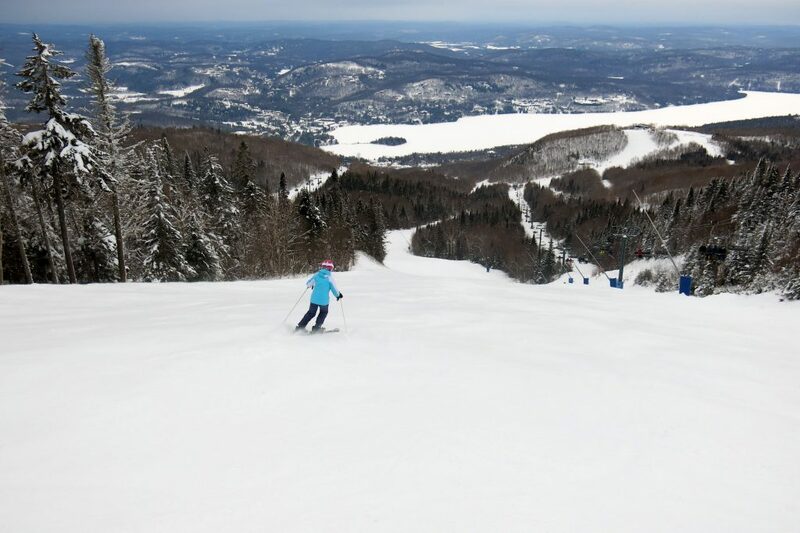 Tremblant has been ranked as the #1 resort in the East by readers in the annual Ski Magazine resort survey. We thought that would be a good way to start our Quebec tour. 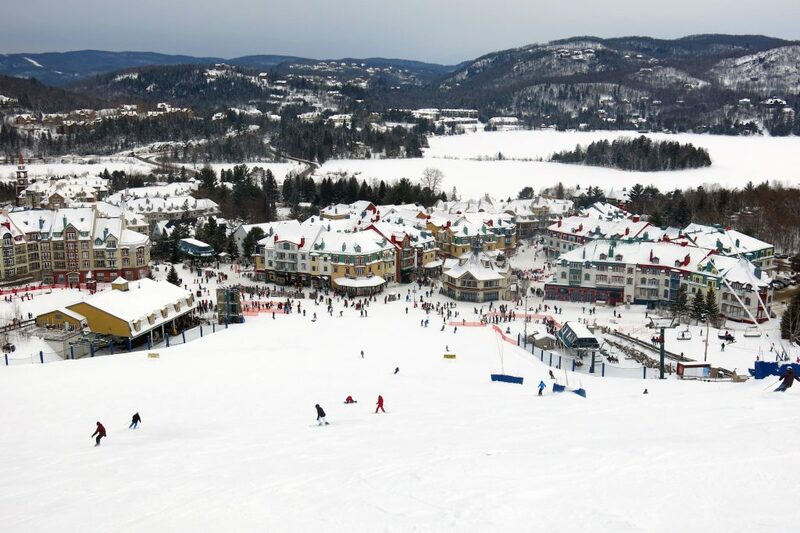 It’s a major resort with what is widely acknowledged as one of the best base area villages in North America. Going to Quebec for the project was our most ambitious undertaking so far. Travelling 3,200 miles in February with a connecting flight in Toronto is a huge risk and we paid the price with huge delays and stress. High winds from the west affected our flight by having us arrive too full of fuel to land! I’ve never heard of that before, but we circled for an hour burning off fuel so we could safely land. We arrived during a rare strong snow storm in Toronto, and our connecting flight to Montreal was delayed by over 5 hours due to airport issues, icing, and a missing crew. Add to that problems in Montreal with getting the bridge to the plane due to too much snow on it, and a 1 1/2 hour delay getting baggage because the baggage handlers were slipping on the ice and we didn’t get on the road to Tremblant until 1:30AM. 2 hours of driving in a snowstorm later we arrived at our hotel and got to sleep for about 4 hours. My advice to anyone that feels like travelling to Montreal for skiing is to do it in March when these things are less likely to happen. Also, never book a flight on WestJet! Going back wasn’t any easier because we were kicked from our flight along with 48 other people due to those west winds which meant the plane could not fly full, so we had to rebook and connect in Toronto again instead of the direct flight we paid for. We took off from Toronto about the time we were supposed to land in San Francisco. On the positive side, the rental cars in Quebec all have snow tires, and people know how to drive safely on snow there. These things make it so much safer and easy driving around on the snow packed roads. We’ve been pretty lucky with crowds and lift lines this year, so the 30-minute wait at the 8 passenger gondola at the South base was a bit of a shocker. The other lift Magic Mile which starts from the same spot serves a lower hill that requires another lift TGV to get to the top, and both of those lifts are very crowded as well. The gondola really needs to be replaced with a higher capacity lift to solve this problem. There is great terrain on both sides of this mountain. 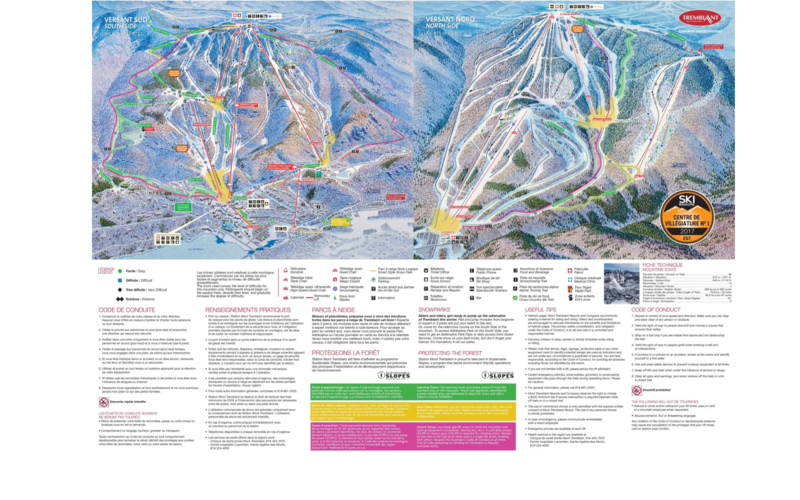 Every lift has access to steeps and intermediate terrain. Most of the single black diamonds and blues are groomed. 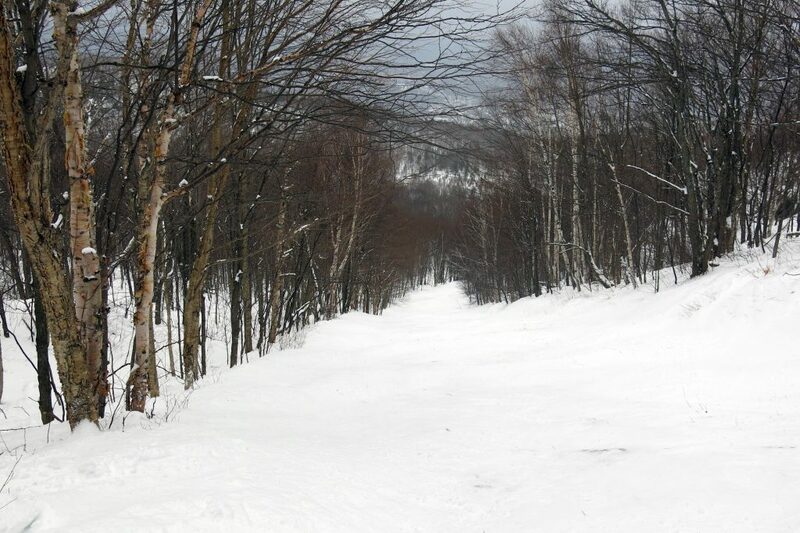 Double-blacks are usually not groomed, and it’s that fact alone that makes them double-black because they are often a sheet of ice in the steep spots. They aren’t really that steep, but the ice makes any sort of steep run a “no fall zone”. The conditions on the first day were some of the best of the year according to locals, but we found large sections of “boiler plate” clear ice that is downright scary when you get hit with a strong tailwind at speed. 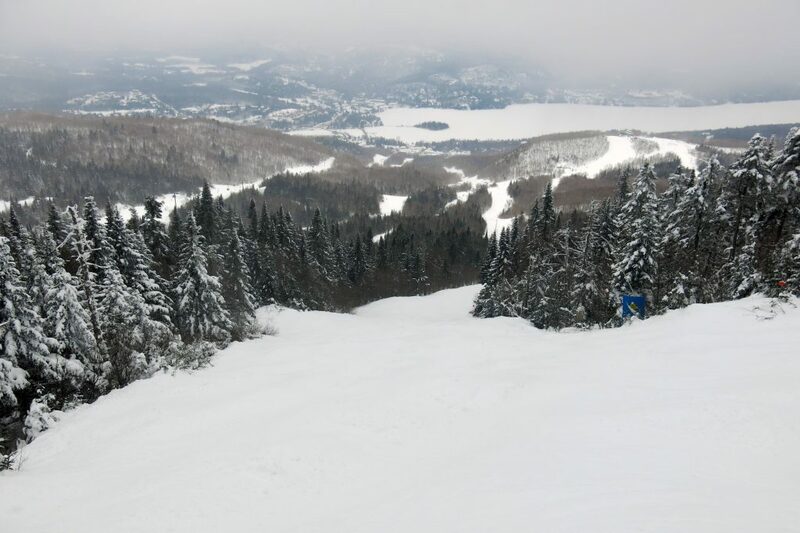 There is a lot of wind at Tremblant because it’s the highest mountain around, and somewhat isolated from other peaks. One quick note about the 2 sides: The “South” side actually faces west, and the “North” side mostly east. Go figure. Our favorite runs on the South Side were the single black groomers at the top Erik Guay (Grand Prix previously), McCulloch, Kandahar, and Taschereau. I also skied most of the double blacks and Ryan Bas was my favorite. 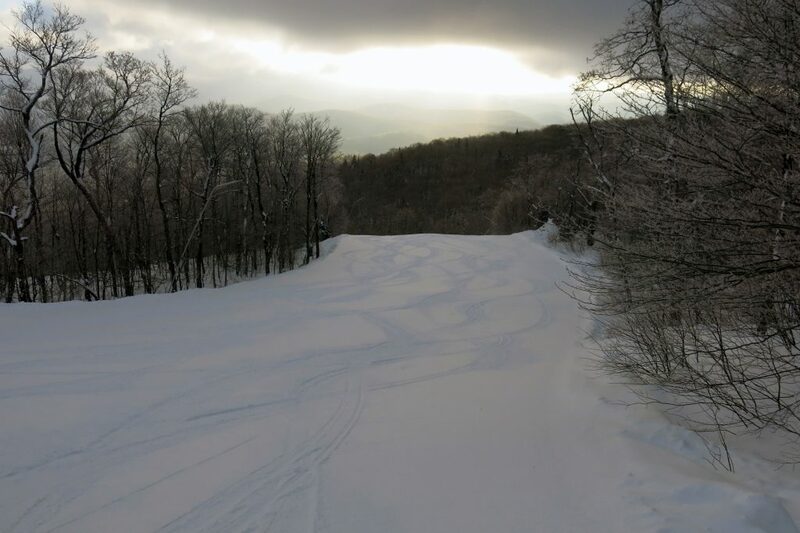 It’s a narrow, icy, rocky, twisting run all the way down the face in classic eastern style. The La Soleil chair is fun, but very exposed to wind and there are only 2 non-beginner runs that go all the way to the bottom and they are basically the same being right next to each other. On the North side, we never got to ski the Edge chair because it closes at 2:30(!) and we didn’t know that so got there about 5 minutes too late. After the first day, it rained and sleeted that night, which is the worst possible thing that can happen when you are skiing because it turns everything into un-skiable ice, and ices up the lifts. The next day there were only 2 lifts open: The Gondola and Duncan, so we never got back to Edge. Lowel Thomas serves only the upper North Side with a good variety of easy blues and greens and a couple of narrow black runs left ungroomed. Unfortunately it’s a fixed-grip triple which needs upgrading given the crowds there. 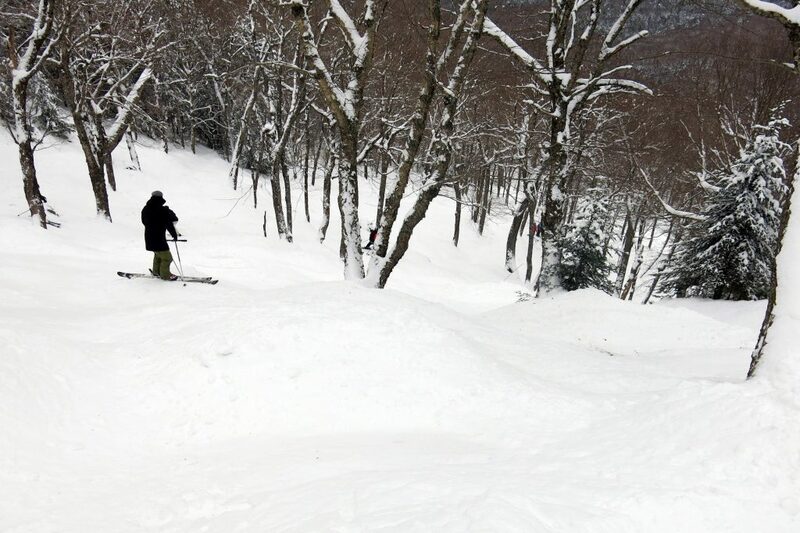 Expo Express serves one of the scariest runs on the East Coast: Dynamite. 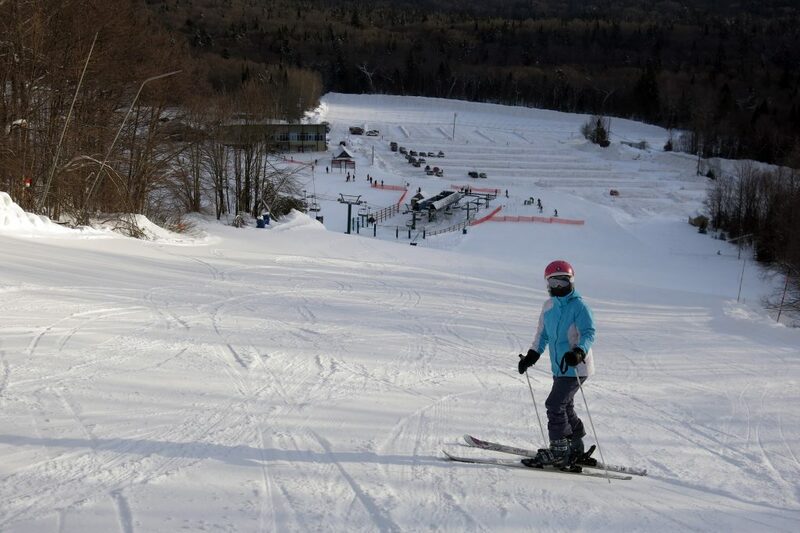 This is the only run on the mountain I absolutely did not want to ski. There is a section in the middle that is solid ice and steep, and I wouldn’t try it unless I had an ice axe in hand because my detuned Mantras were not up to the task. Buzz was interesting as a short gladed run that was a lot of fun. Duncan is the North’s big vertical bottom to top chair, but it’s incredibly crowded so we only got to ski it the 2nd day when we took advantage of the First Tracks program that was included with our hotel reservation. At 7:45 we boarded the gondola and rode to the top with about 100 other people. For the next hour we had the Duncan lift to ourselves and really enjoyed the 4 black groomers there. This is a great program and I urge everyone to take advantage of it even if you have to pay because it’s really worth it. We went in for breakfast after that and when we came out we realized that there was a problem because there was a huge line at the Gondola and nothing else was running on the South Side. Turns out the sleet from the night before iced up all the other lifts other than Duncan, so our day was over early. Boo! 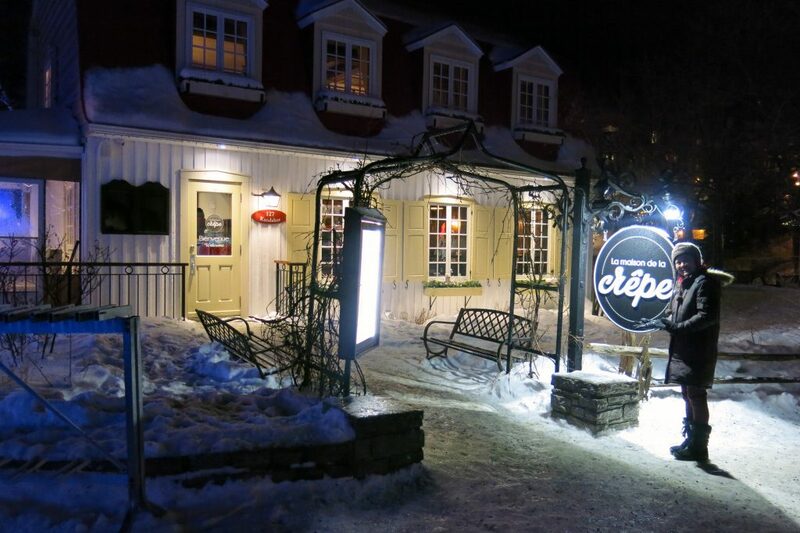 Now is a good time to mention that when it’s time for food, your best options are in the village. There are tons of choices there, and we found excellent food at the 3 we tried. 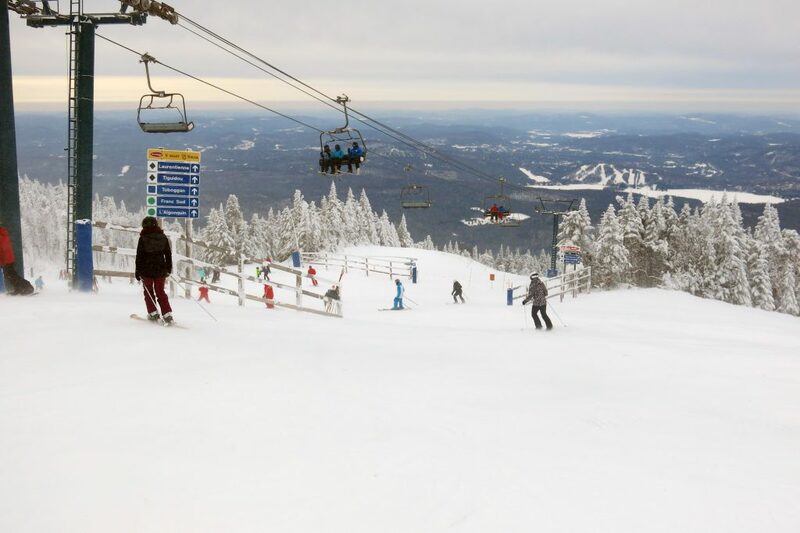 This was really the biggest positive of Tremblant for us, and it’s a big one, but it can’t overcome the negatives of snow quality, crowds, and poor lift network. To backup our opinion, we spoke with one local on the 2nd icy day who had been there 10 times in the current season and ALL of them had bad conditions. There must be something that keeps bringing him back 10 times in one season, but it’s probably not the ski conditions! 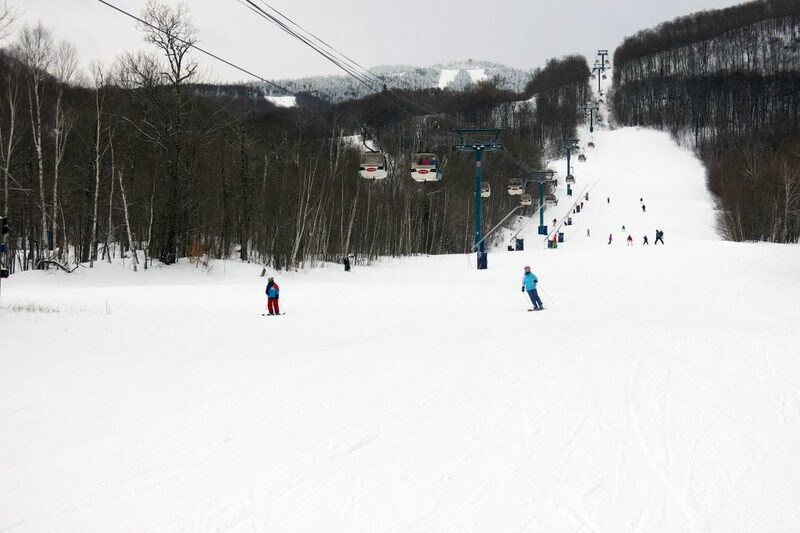 The 2 other major resorts in Quebec are much more enjoyable as ski destinations, so if we found ourselves in Quebec again we would go to Le Massif and Mont-Sainte Anne. 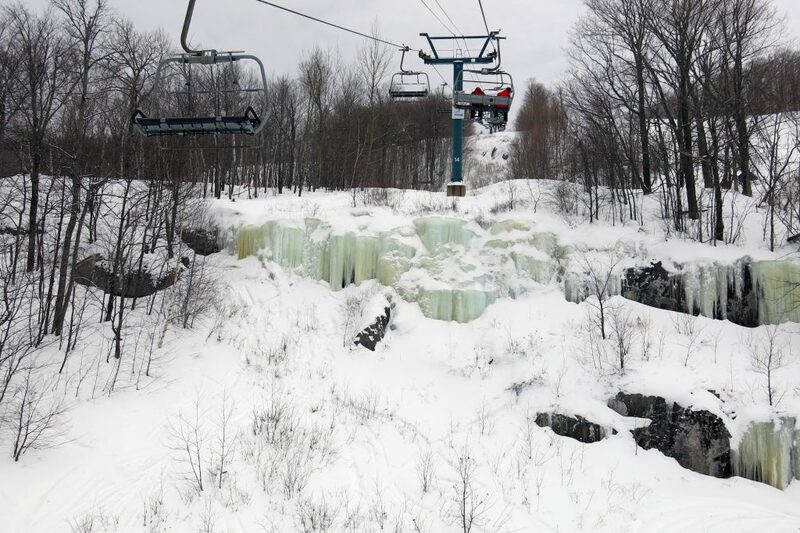 The lift situation regarding the Gondola on the South and the Duncan Express on the North really needs to be improved. These are fixable issues that will hopefully be addressed soon.